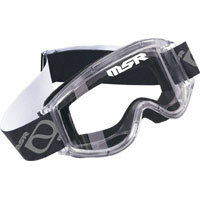 These MSR goggles keep your view clear, even in the worst conditions. Stay safe and keep your eyes protected. These are fairly basic goggles and sport a low price to match. But read on to see why they're a nice value. The lexan lens is easy to clean and tough to break. When the race gets hot, even if you start to sweat, no one has to know. The goggles are lined with high density open cell foam to wick that sweat away before it gets in your eyes. Sub dye printed straps resist fading and stains, so your goggles will remain looking sharp. A flexible PVC frame helps give you a custom fit. The stylish looks and great functionality of these goggles make them a great deal at a low price. Speaking of stylish, check out how great they'd look alongside the MSR Renegade racing gloves. Click here to find this product on Revzilla.com.